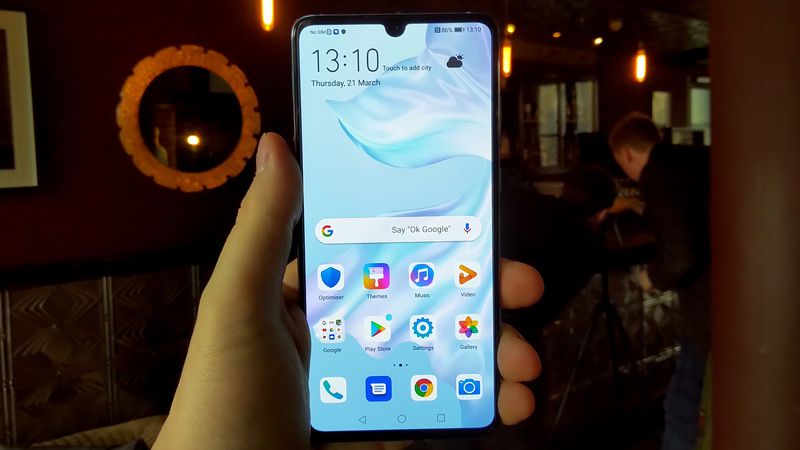 Huawei has a very regular release schedule for its smartphones: in late Q3/Q4, it launches a new Mate series smartphone with the company’s latest processor and AI technology, designed to appeal to the early adopters who want the latest technology at their fingertips. Fast forward about six months, and Huawei typically launches a ‘P’ series smartphone, built on the same core hardware, but focusing much more on the photography features that typically appeal to the mass market. The idea is that the P series smartphone takes the faster processing power of the new chip, now six months old, and combines it with dedicated camera technology and Huawei’s latest updates in software and style, at a more comfortable price point. 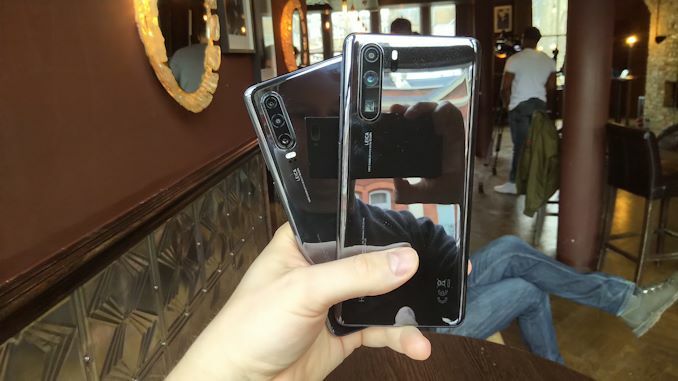 The two new smartphones announced today are the 2019 updates to the P series: the Huawei P30 and Huawei P30 Pro, with the latter being the upsell model with enhanced features to go with an enhanced price. The highlight of the smartphones this year is the new SuperSpectrum camera sensor, which is featured on both smartphones. This new sensor readjusts how it records light coming into it: most camera sensors are RGGB, meaning that each pixel has one red sensor, two green sensors, and a blue sensor, which it then combines into the correct color for that pixel. This new sensor replaces those two green sub-pixels with two yellow ones, to make the sensor sensitive to RYYB instead. According to Huawei, based on the intensity of light typically absorbed into a camera module and through the lenses, this allows for more light into the sensor, and thus more detail. Using a yellow sub-pixel also allows for additional red and green absorption, enhancing red colors, which can be deficient (according to Huawei) in modern smartphone photography. This allows for additional features in the hardware, or better quality, such as an enhanced Night Shot mode. 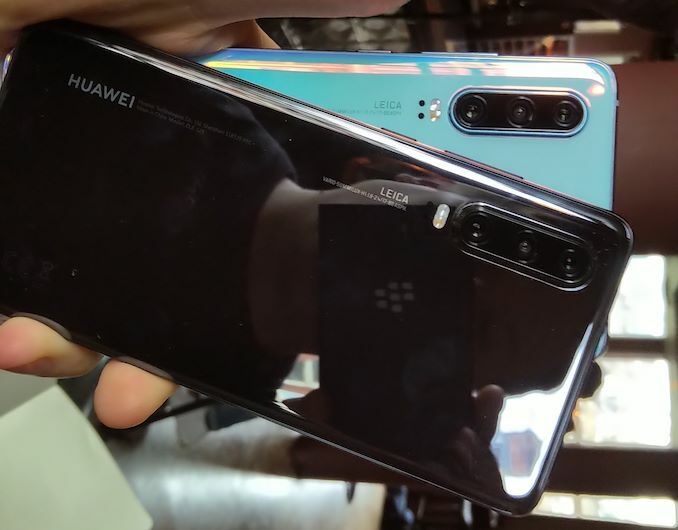 Huawei claims that in order to support this feature, both the hardware and the software for the camera implementation had to be redesigned from the ground-up. This new sensor introduces two features: Super HDR Shot and Super Low Light Shot, both of which promise better color reproduction in variable brightness and low-light scenarios. The Super Low Light Shot, as the name suggests, attempts to draw more detail from limited light scenarios, similar to low light modes in other smartphones, however Huawei wants to claim that theirs is the best. Huawei has also made both smartphones support an ISO level of 409600, up from 102400 on the previous year models. How effective such a high ISO mode is questionable, given how grainy such a mode tends to be. Also on both smartphones is a new periscope lens. This new camera and lens allows for 3x optical zoom on the P30 and 5x zoom on the P30 Pro, or as the company will state, ‘up to 10x lossless hybrid zoom’ when combined with its additional software and data from other sensors. Huawei makes this possible by using a 90-degree prism lens in its telephoto sensor, providing a focal length of 125mm on the P30 Pro. As a result, it makes the camera look very deep into the device. However, the demo photos we took with the mode show that it is very effective. Based on our third floor testing area, we were easily able to make out the person on the street putting in their PIN into the cash machine below. 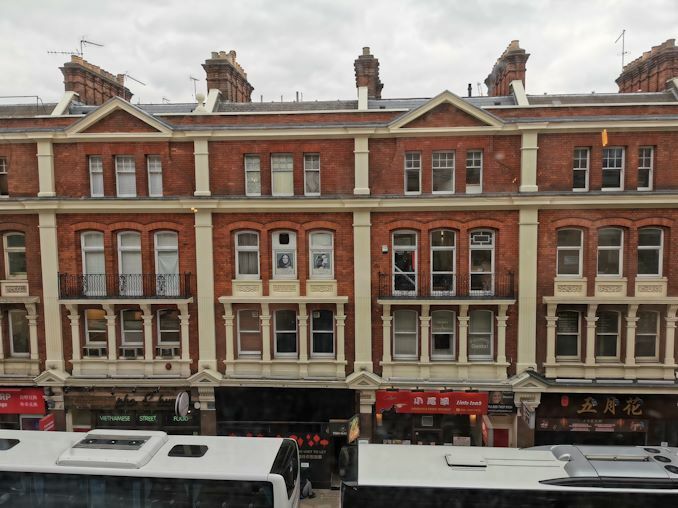 Both smartphones – via a future over-the-air update – will also enable a ‘Dual Video’ mode, allowing a video to be taken with the SuperSpectrum camera and the telephoto camera at the same time. Both videos will be merged into a side-by-side video and saved as one file, which users can then upload to social media. It is expected that this feature will be enabled within a month or so. Standard video recording on both models is enabled up to 4K30, or 1080p60. For the front facing cameras, Huawei has moved from a 24MP sensor to a 32MP sensor. In recent years, Huawei has implemented a PixelFusion technology on its big rear cameras that converts 4 pixels into 1, allowing for more detail in exchange for a lower image resolution – the SuperSpectrum sensor has it, however this new 32MP front facing sensor does not. Both devices support AI enhanced stabilization modes, on top of the additional stabilization that specific cameras have. Both devices also use a HiSilicon Kirin 980 SoC to power the units, and built-in Goodix based in-screen fingerprint sensors (based on details at MWC, we believe these are Goodix’s second generation sensors, however Huawei does not disclose details about its suppliers). From here on out, the models differ. The P30 Pro is the larger model, with a 6.47-inch display and a 2340x1080 resolution for the OLED screen. 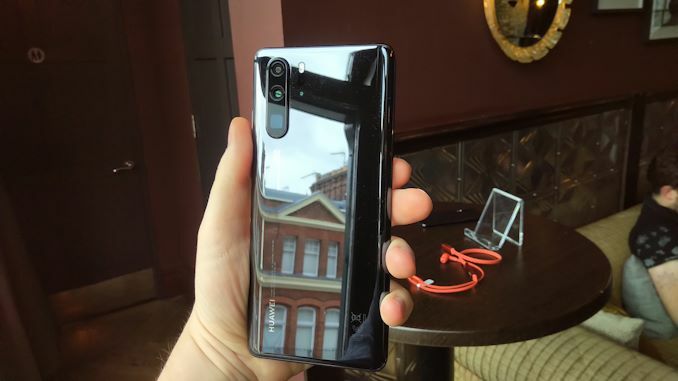 The front and back of the device use curved glass, and the speaker at the top of the phone has been removed, replaced with an ‘Electromagnetic Levitation’ speaker that vibrates the screen to provide the sound you expect to hear during phone calls. Huawei states that this is designed to focus the sound into the ear. A 20MP ultra-wide-angle camera, with a 16mm focal length and f/2.2. The 40MP SuperSpectrum camera that has PixelFusion technology, a 27mm focal length, f/1.6, and also has optical image stabilization (OIS). An 8MP telephoto camera, supporting 5x optical (10x lossless hybrid) zoom, with a 125mm focal length and f/3.4, also supporting OIS. The ‘plus one’ sensor is a Time-Of-Flight sensor, similar to what we’ve seen on other devices such as the LG G8. This includes a flood illuminator which works with the ToF to provide depth information for photo layering effects such as background replacement (used with AI) and live variable bokeh. Using the AI features of the phone with the ToF sensor also allows the P30 Pro to measure height and length by pointing the camera at an object/person in range. 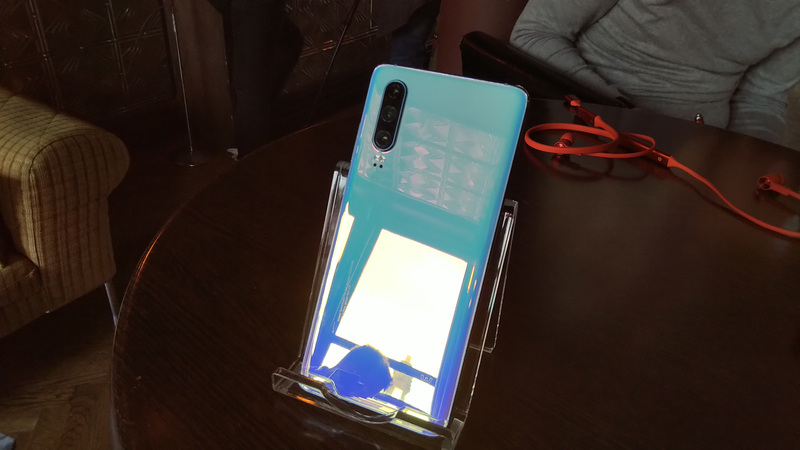 The P30 Pro has a 4200 mAh battery, supports 40W wired charging (good for 70% in 32 minutes), but also supports 15W wireless charging, as well as wireless reverse charging, similar to the Mate 20 Pro. The P30 Pro does not have a 3.5mm jack, whereas the P30 does. The P30 Pro is IP68 rated for dust and water, similar to last year. The P30 is a little smaller, at 6.1 inches, but has the same 2340x1080 resolution as the P30 Pro, which actually makes the screen a little bit sharper due to a higher pixel density. It is still the same type of OLED screen, but the device does not use the same curved glass design, opting for a simpler feel. The ultra-wide camera is only 16MP, not 20MP, and the SuperSpectrum has no OIS, and the telephoto camera doesn’t zoom as much. 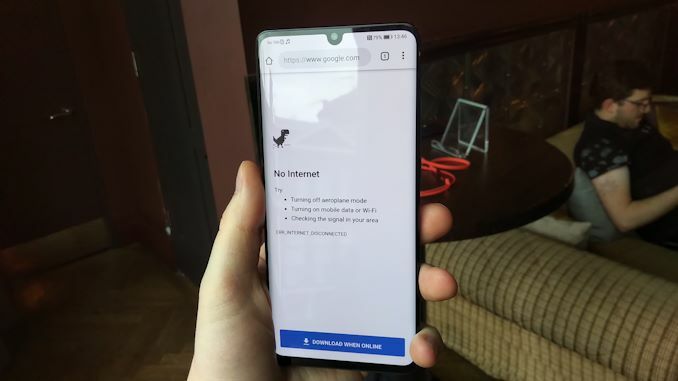 But this is all part of the upsell, tempting users towards the P30 Pro. There is no time-of-flight sensor here, but overall the camera setup is still formidable. AI stabilization is still supported for longer exposure shots, and feature such as Super HDR Shot, Super Low Light Shot, and that 400K ISO are still present. As the phone is slightly smaller, the battery is 3650 mAh, which again is still sizeable, and the device supports 22.5W wired charging, which is good for 58% in 30 minutes. Unfortunately there no wireless charging on this model, but it does have a 3.5mm audio jack! Similar to last year, the P30 is IP53 rated. Both devices will come shipped with that latest version of EMUI 9.1, which is Android Pie-based. This means that the latest AI features are included, as are the impressive GPU Turbo on certain games, performance mode, enhanced security, and payment options (with specific vendors to be named at the launch event). Huawei states that there are 1500 software developers globally specifically focusing on its implementation of its AI SDK, making applications for a wide spectrum of use cases, such as an app that helps track visual impairment in children, or allows for body movement recognition with additional depth information for in-game character creation. Huawei also showcased that it has partnered with Audi to support seven vehicle models as a digital car key. With the correct app, users of supported models can lock/unlock their cars, start the engine, or get the heater ready in the morning. Huawei states that their software stack supports CC and EMVCo security authentication, two common standards in this space. Also supported are OneHop and Huawei Share with supported Huawei notebooks, such as the Matebook 13, Matebook 14, and Matebook X Pro announced earlier this year. Both the P30 and P30 Pro will be available in all five colors, however which colors are available in different regions will depend on which models carriers will want to stock. All of our details here so far (if you’re reading this straight after we posted) came from a pre-briefing we had before the official announcement. Huawei always keeps certain details behind to be announced at the event, specifically release dates and pricing. In this instance, they’ve also held back details on memory and storage, although our demo units had 6 GB of DRAM and 128 GB of storage, so we can guess that they will be. We will update this story as we get this information. Hopefully we will be picking up our review units today, and we’ll look into a review as soon as we can. Update: Added pricing, DRAM, and storage to table. 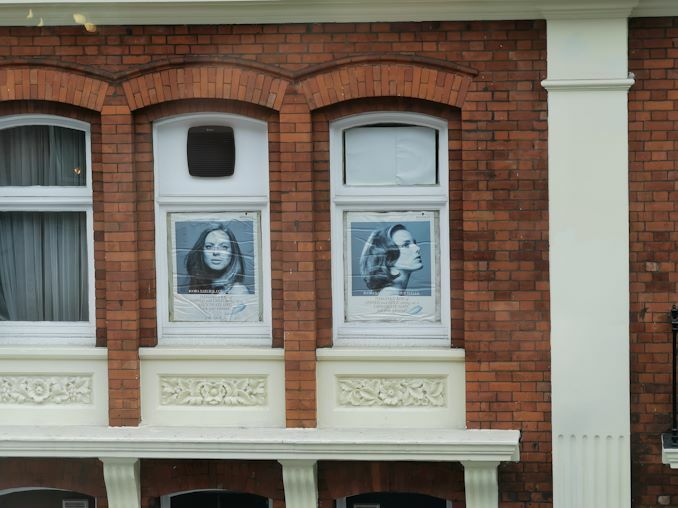 "P for Photography" is pure market talk. The main sensor's daylight performance has regressed to P20P levels (Pixel remains the only one retaining realistic texture) and low light is basically as excepted given the sensor size and aperture, they claim an additional...30%?40%? sensitivity with the RYB but I don't see that, and I believe the jump from the wildest colors (in P20P) to the most muted colors (among the current generation of flagships) is to mask the RYB's lack of color information. I saw some samples in which the shrubs (green, obviously, from other smartphones) are rendered grey, but that doesn't stand out unless you paid specific attention, which I believe is their intent. And of course there's the issue of swapping the 3x telephoto for 5x and bragging about "50x zoom", we knew that sub-3x crop performance was worse than the 2x competition before, but now most of the range from 1.1x-4.9x is worse from that swap. The night mode is a notable improvement, but their 1/1.7" still doesn't match Google's 1/2.55" in this respect.